Gumballs from Oakleaf (850 count). Please note:each 4.8lb bag contains approximately 283 pieces...each 14.2 lb. case contains 850 pieces) This item is Kosher, however, if you order the bag quantity there will be no Kosher symbol. The symbol only appears on the original case the item is packed in. If the symbol must be present to be acceptable, then please order the case quantity. These delicious, colorful gumballs in assorted flavors will make everyone happy. Each piece is imprinted with the words Bubble King. Perfect for Halloween, parties and promotions. Great for refilling those fun gum ball machines. Kosher Parve. Each piece is approx. 1" in diameter. Sold in bulk, delivered in a 4.8 lb. bag or a 14.2 lb. case. The bag pack of 4.8 pounds contains approximately 283 gumballs . 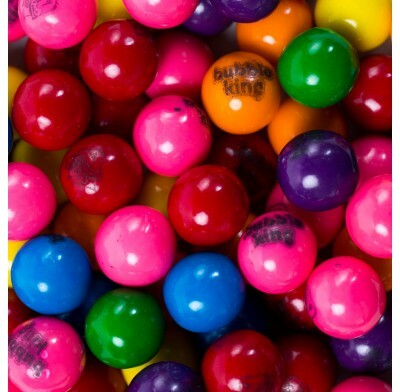 Each case contains 850 gumballs (850 count is the industry standard for describing the size of the Gumball, and refers to how many pieces there are in a full case). Gumballs from Oakleaf (850 count). Please note:each 4.8lb bag contains approximately 283 pieces...each 14.2 lb. case contains 850 pieces) This item is Kosher, however, if you order the bag quantity there will be no Kosher symbol. The symbol only appears on the original case the item is packed in. If the symbol must be present to be acceptable, then please order the case quantity. These delicious, colorful gumballs in assorted flavors will make everyone happy. Each piece is imprinted with the words Bubble King. Perfect for Halloween, parties and promotions. Great for refilling those fun gum ball machines. Kosher Parve. Each piece is approx. 1" in diameter. Sold in bulk, delivered in a 4.8 lb. bag or a 14.2 lb. case. This bag pack of 4.8 pounds contains approximately 283 gumballs . Each case contains 850 gumballs (850 count is the industry standard for describing the size of the Gumball, and refers to how many pieces there are in a full case).